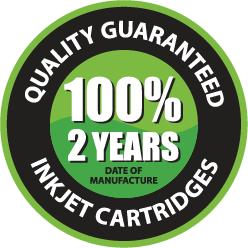 All inkjet cartridges remanufactured by Jet Tec are fully guaranteed against defects due to faulty materials or workmanship. If for any reason you are not completely satisfied with a Jet Tec inkjet then please return the product to the dealer with proof of purchase. If for any reason the situation arises whereby it is claimed that a Jet Tec product has damaged the printer, the following shall apply. Jet Tec guarantees that, in normal use its products will not cause damage or abnormal wear when used in printers in which they are designed to operate. Jet Tec shall not be liable to the buyer if any damage or abnormal wear to a printer that is claimed to have been caused by the use of a Jet Tec product, could have been caused by goods not supplied by Jet Tec used in the printer before or after the use of a Jet Tec product. Jet Tec reserve the right to collect and inspect and if necessary repair the printer. If it is found that damage has occurred as a direct result of a Jet Tec cartridge then Jet Tec will repair the printer or replace the printer with a working equivalent, and return the printer within 20 working days of receipt of the defective device. Jet Tec’s liability for the buyer shall not exceed the amount required to repair or replace the printer if found damaged by a Jet Tec product. This guarantee shall cease to take effect if the Jet Tec products are damaged, either willfully or negligently, dismantled or otherwise tampered with or misused by, for or on behalf of the buyer or any third party. The Guarantee shall cease to take effect if the Jet Tec products have been purchased from market or Internet traders that are not recognised as official Jet Tec suppliers by Jet Tec International. The markets could include, weekend markets / computer fairs / car boots sales etc. All inkjet printers have a finite lifespan. A printhead may fail due to it reaching the end of its working life. In this specific case it is not the Jet Tec product that has damaged the printhead. Although we cannot determine the true age and level of use of a printer, Jet Tec will use their discretion to determine whether the printer has reached the end of its life. This is best determined by looking back to the date the printer became obsolete according to the printer manufacturer. If we determine the printer had indeed reached the end of its life we accept no responsibility and will not be liable to repair or replace the printer. All Jet Tec remanufactured laser toners are fully guaranteed against any defects and are produced to match the OEM product in performance, print quality and page yield. If for any reason you are not completely satisfied with a Jet Tec remanufactured laser toner then please return the product to the dealer with proof of purchase. Jet Tec guarantees that, in normal use its products will not cause damage or abnormal wear when used in printers in which they are designed to operate. Jet Tec shall not be liable if any damage or abnormal wear to a printer could have been caused by goods not supplied by Jet Tec used in the printer before or after the use of a Jet Tec remanufactured laser toner. Jet Tec reserve the right to collect, inspect and if necessary repair the printer. If it is found that damage has occurred as a direct result of using a Jet Tec laser toner then Jet Tec will repair or replace the printer. Jet Tec may alternatively choose to send an engineer to the customer to inspect and if necessary, service and repair the printer. Jet Tec’s liability for the buyer shall not exceed the amount required to repair or replace the printer if found damaged by a Jet Tec product. If an identical printer model is unavailable an equivalent printer model will be supplied in the circumstance that the printer is to be replaced. This guarantee is valid for a period of 36 months and shall cease to take effect if the Jet Tec products are damaged, either willfully or negligently, dismantled or otherwise tampered with or misused by, for or on behalf of the buyer or any third party. The guarantee shall cease to take effect if the Jet Tec products have been purchased from market or Internet traders that are not recognised as official Jet Tec suppliers by Jet Tec International. 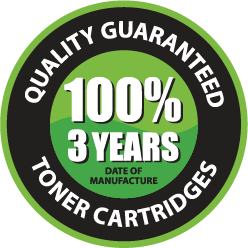 Laser toner cartridges are guaranteed for three years and ink cartridges are guaranteed for two years.